1. Users data is increasing, then we will implement cache mechanism to improve performance. 2. Cache mechanism also having certain limlits. If we use above, then advantages of RDBMS has gone. Google also faced same problem, then they started with Big Table. For faster performance we use HBase. 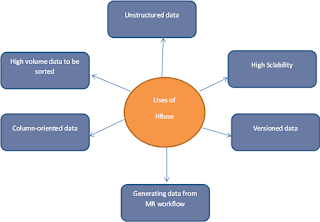 What ever the features hive will not support like crud operations, we can do with HBase. If anything need to be updated in real time access ,HBase if very useful. Ad Targeting in real time is very faster. What is Common problem with existing data processing with Hadoop or Hive? 4. 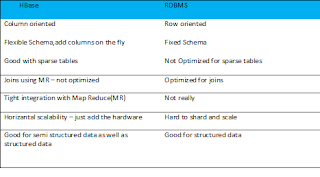 Variable Schema- will support to enhance or increase the column names at runtime, which is RDBMS is not supported. 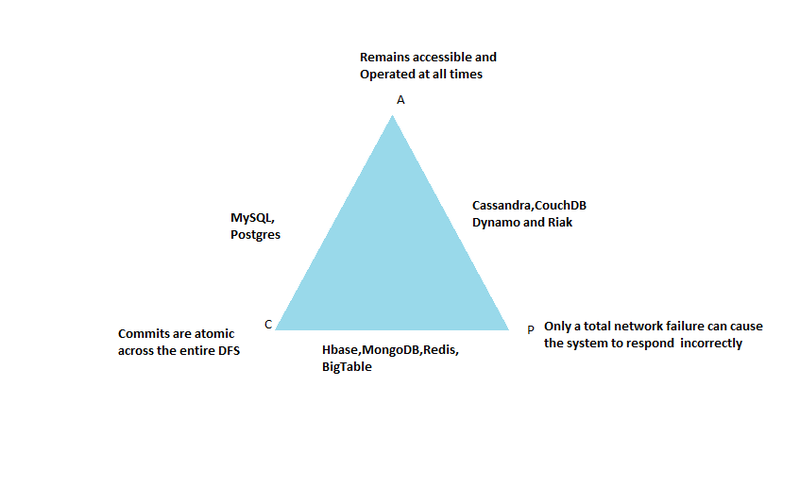 How Traditional System(RDBMS) will solve this? Case: If we want to design Linkedin database to maintain connections? But in case of HBase, we can save all the details about users and connections in same column family. Example : How data stored in sorted way? When ever user try’s to access abc.com , then mail.abc.com will not be returned in case of normal storage. If we use sorted storage then data will be stored like below. If we store like above, then it is easy to access the same. This is mathematical term. If there is null value for particular column , then it will not store. 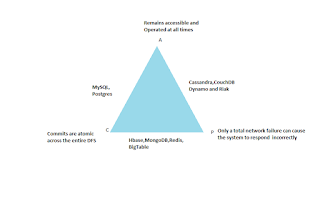 1.Each No SQL databases as mentioned above is same, they have developed for their purpose. 2.Dynamo is developed by Amazon and it available in Cloud. We can access the same. 3.Cassandra developed by Facebook and they will be using the same. It is combination of Dynamo and HBase, all the features available in Cassandra. Any No SQL database will have all the characteristics. It will satisfy only two property at the same time. It is a non -relational (NoSQL)database, which stores data in key value pair and it is also called as hadoop database. 3. Multi –dimensional (table name,column name,timestamp) etc.. When not to use HBase? 1. When you have only few thousand or millions records then it is not advisable to use HBase. HBase can run in local system –but this should be considered for a development configuration. 1.facebook monitored their usage and figured our what they really needed. 2. An ever growing set of data that can be accessed rarely. These are the characteristics of HBase. HBase is using not only facebook.But also twitter,yahoo etc… they will use to process their large volume data. 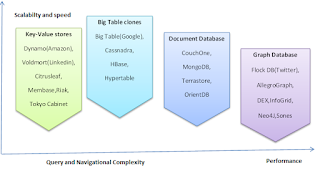 How data distribution will happen in HBase? 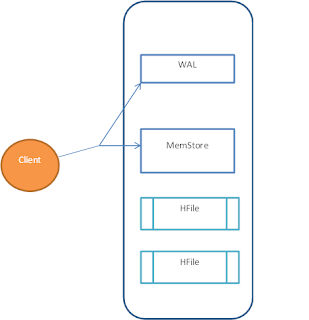 How HBase will write data to the file? 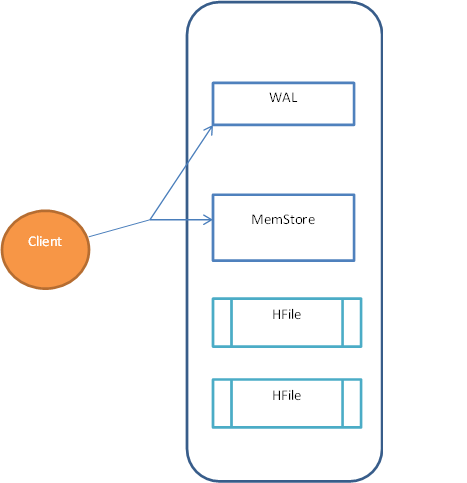 1.Every HBase requires confirmation from both Write Ahead Log (WAL) and the MemStore. 2.The two steps ensures that every write to HBase happens as fast as possible while maintaining durability. 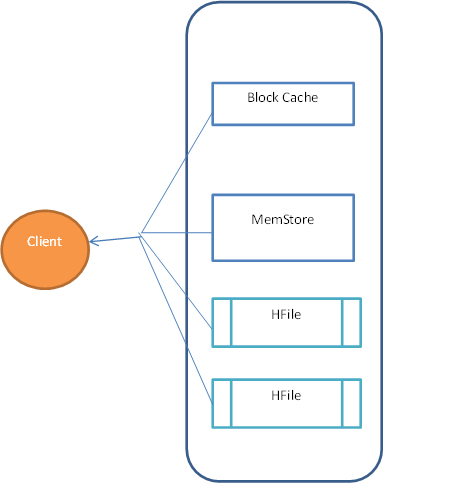 3.The Memstore is flushed to a new HFile when it fills up. 4.Usally Memstore default size 256MB, once it is filled up then , it move that information to HFile it's default size is 64 KB. 5.It will be act as a immutable object. 1.Data is reconciled from the block cache, The Mem-Store and the HFiles to give the client an up to date view of the rows which client requested for. 2.HFiles contain a snapshot of the Memstore at the point when it was flushed. Data for a complete row can be stored across multiple HFiles. 3. In order to read complete row, HBase must read across all HFiles that might contain information for that row in order to compose the complete record. All HFiles will be compacted and put as Compacted HFile. 3. 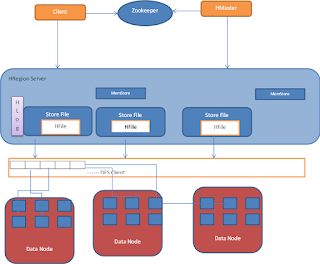 Master Server – Daemon responsible for managing HBase cluster. 4. HBase stores its data into HDFS- Relies on HDFS’s High availability and fault tolerance. This architecture will explain you about how Hbase will work. 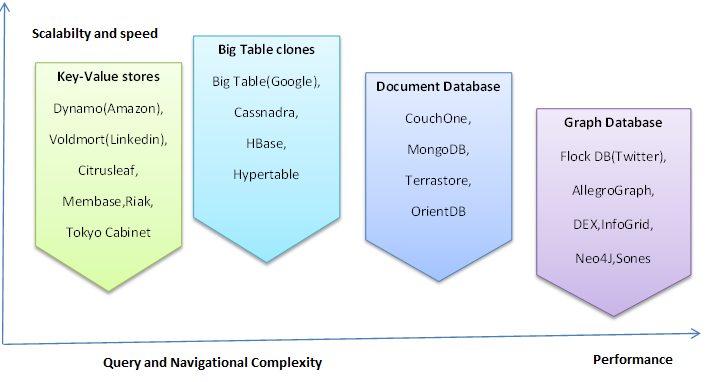 This is Basics about HBase. My next post you can see How to install and work with HBase.